Most parents would readily cross oceans to save their child’s life, with no thought as to the cost or distance. But for some children in the UK, like Alfie Evans and Charlie Gard, that simply wasn’t an option they were given. 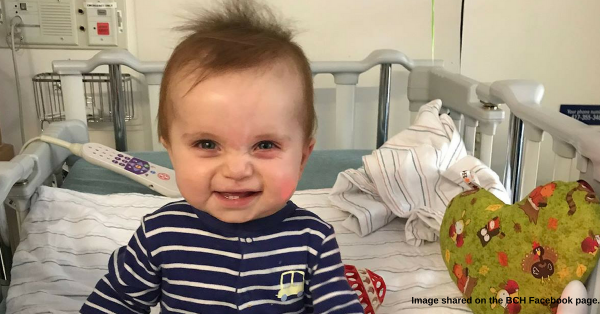 Oliver Cameron is one of the fortunate ones, though, and thanks to the tireless efforts of his parents and doctors at Boston Children’s Hospital, Oliver is alive and thriving today. When Oliver was born in the United Kingdom, he had a large, non-cancerous tumor in his heart, called a cardiac fibroma. It was so rare that doctors in the UK weren’t able to treat it. Only a handful had even seen it. Their research led them to Boston Children’s Hospital, where another little girl, Francesca, had successfully had her large cardiac tumor removed. Her story was posted on the Boston Children’s Hospital Facebook page the day after Oliver was born, which Lydia took as a sign. So she reached out to Francesca’s doctors, Dr. Pedro del Nido and Dr. Tal Geva, and sent Oliver’s records to them. They responded that he would be a good candidate for the surgery — even though the NHS doctors were insistent that Oliver’s tumor could not be removed. But the difficulties of getting Oliver treatment weren’t over yet; the Cameron family now had to find a way to pay for it. At first, the NHS refused to pay. “Oliver’s cardiologist spent hours of his own time trying to get Oliver to Boston — he kept applying and reapplying for the National Health Service to cover the surgery in the U.S., but with no luck,” Lydia said. “So, we started our own fundraising campaign, because we had no other way to get him there.” But after they successfully raised most of the money, they got good news: not only would the NHS pay for the surgery, they would also send two cardiologists and a cardiac surgeon to learn from the doctors at Boston Children’s. The tumor ended up being one of the largest the doctors had ever seen. The Camerons were exceedingly fortunate that they were able to bring Oliver to the United States to receive treatment. It’s a blessing not given to everyone, denied most notably to toddlers Charlie Gard and Alfie Evans. The parents of both boys were told that treatment was futile and that they should just be allowed to die; when the parents raised money to seek treatment outside of the United Kingdom, hospitals and courts refused to allow it, and forced both boys to be removed from life support. In Oliver’s case, had his parents not fought for him to go to the United States for treatment, he would have needed to wait for a heart transplant — and as infant heart transplants are exceedingly rare, there is a good possibility he would have died waiting. It stands to reason that parents should have the right to seek medical care outside of the United Kingdom for their children, even if the NHS thinks treatment will fail or is futile.